I bet you had a chemistry set as a child – after all, now you’re reading Chemistry World. Maybe you tinkered with a substantial rack of test-tubes containing compounds that would now be considered dangerous or daring: potassium permanganate, sodium thiocyanate, perhaps supplemented with stronger stuff bought at the chemical supplier’s or ‘borrowed’ from school: nitric acid, lumps of sodium under oil. Younger readers might have been denied such pleasures, having to be content with litmus paper for measuring soil pH. Today’s sets are likely to be more about ‘kitchen chemistry’ or ‘colour chemistry’, using nothing more hazardous than bicarb and food dyes. But what were these sets for? Are they toys? Were the meant to educate or to amuse? 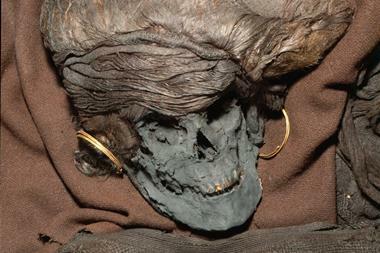 Why were they produced, and for whom? And why do they seem – I’m sure it isn’t just me – to pack such a nostalgic punch? It wasn’t until the second half of the nineteenth century that toy manufacturers began to make commercial sets as educational tools tailored for the affluent middle classes. 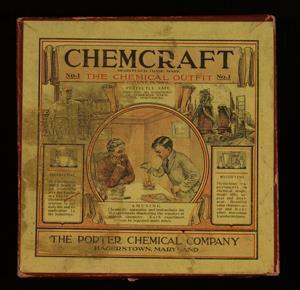 The intended audience is clear from one of the CHF’s earliest items, a Chemcraft set sold around 1917 by the Porter Chemical Company in Hagerstown, Maryland, one of the major manufacturers of chemistry sets in the US throughout most of the twentieth century. Like Ede’s set almost a century earlier, it is housed in a handsome wooden box with the ingredients kept in elegant little wooden bottles. The lid shows a well-bred young lad in suit and tie, hair neatly gelled, bending over his little burner under the watchful eye of his father. Alongside but independent of the chemical cabinets, science popularizers of the nineteenth century produced how-to manuals describing experiments for children using household ingredients. Ede’s earliest cabinets were intended to accompany the popular 1823 book on chemical experimentation, Chemical recreations by John Joseph Griffin – but Ede’s company later sold them independently with its own bespoke pamphlet. These two traditions of the cabinet and the booklet merged, so that when the chemistry sets became available to a wider ‘toy’ market at a slightly cheaper price from the 1900s, the accompanying instruction manual became indispensible. Both the early chemistry sets and the experimental booklets had a strong link to the tradition of ‘performative chemistry’ that developed during the nineteenth century. Dramatic chemical demonstrations were a hallmark of the public talks at the Royal Institution given by Humphry Davy and Michael Faraday in the early part of the century. 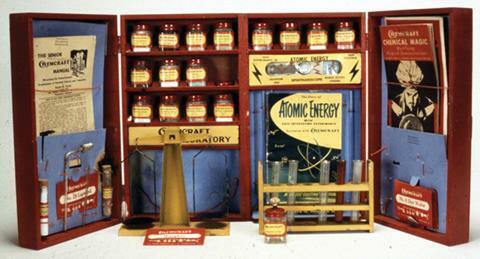 ‘These performances were intended to make chemistry “familiar”, as enticements to active practical investigations that could be carried out in the home’, says historian of science Salim Al-Gailani of the University of Cambridge, who has made one of the few detailed studies of chemistry sets.2 He says there is a clear link between publications such as Faraday’s book of his RI lectures, Chemical history of a candle (1861), the penny-pamphlet handbooks and later chemistry-set manuals. Chemistry displays, lodged somewhere between music-hall spectacle and public education, were refined at institutions such as the Royal Polytechnic Institute in London, where lecturers like John Henry Pepper wowed audiences with chemical magic. Pepper, best known for devising the illusion of ‘Pepper’s ghost’ used in performances of Hamlet and A christmas carol, went on to set up his own Theatre of Popular Science and Entertainment at the Egyptian Hall in London, the home of Victorian stage magic, and took his show on tour in the US and Australia. Some stage magicians were even contracted to write popular treatises on chemistry. This link between stage magic and the early chemistry sets is personified in Albert Gilbert, the founder of the A C Gilbert Company of New Haven, Connecticut, which was the main US rival to Porter’s Chemcraft and became one of the biggest toy firms in the world. Gilbert was a stage magician, and he founded his company in 1909 to supply materials for magic shows, marketed under the brand Mysto Magic. 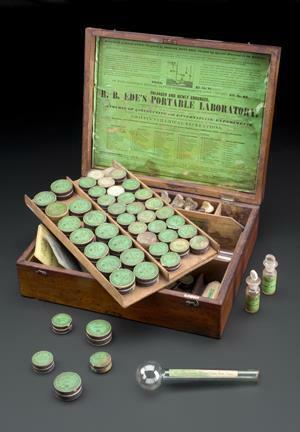 The CHF’s early Chemcraft sets reflect this association too, promising ‘Mysterious experiments in chemical magic.’ There were hints of a connection with alchemy, for example in the suggestion that the deposition of copper onto iron was a kind of transmutation. The manuals offered tips on how to stage a magical demonstration, combining practical instruction with the misdirection and sleight-of-hand methods of the magician. This dabbling with the old imagery of alchemy was sometimes filtered through racial stereotyping that seems shocking now. This tension, says Boyd, is just one of the ‘many contradictions inside these eye-catching boxes: between dreams and reality, structured learning and free exploration, mysterious magic and rational science, safety and danger’. The boxes in which the kits were housed sent out contrasting messages about what home chemistry was all about. Many show the experimenter as a young scientist, in the time-honoured chemist’s pose of holding up a test-tube or flask of coloured liquid. Some offer a futuristic, utopian vision of science as saviour, perhaps with the tubes of a chemicals plant hovering in the background. ‘Experimenter today, scientist tomorrow’, promises a Chemcraft manual from 1934. The imagery throughout is decidedly male. 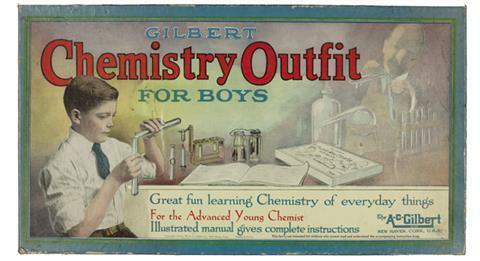 ‘Manufacturers’ expectations and assumptions about masculinity are particularly apparent in chemistry set marketing copy in the United States in the twentieth century’, says Al-Gailani. He points out that, after the second world war, chemical experiments that might earlier have been presented as ‘magic’, such as invisible ink, would instead be likened to the crime-fighting associated with the FBI, ‘an institution that was immensely influential in defining and popularising the predominant “all-American, square-jawed” masculinity of the post-war era’. Chemistry was not just a male but a manly affair. 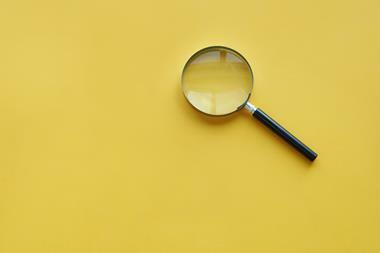 The disheveled ‘mad scientist’, while beginning to feature in movies, is nowhere to be found here – instead, the young experimenter is smartly dressed and well disciplined, accustomed to following instruction (manuals). If he obeyed the rules, a chemistry set wasn’t just a recreational pursuit but a preparation for a career in science. Did girls get a look in? A British Lott’s set from around 1915 claims that it is for both boys and girls, and reassuringly places the home chemistry lab in what looks rather like a domestic kitchen, albeit with (highly questionable) periodic tables on the walls. But if girls did chemistry, it was with a view to preparing them for their obligations in ‘mother’s kitchen’, not the laboratory. 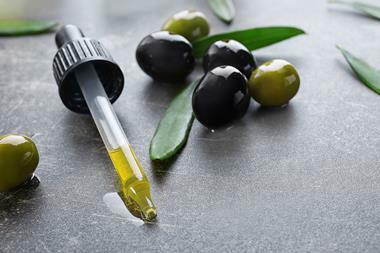 As a Chemcraft manual put it in 1933, ‘In the home, the housewife who knows nothing of the chemistry of the foods she prepares or the materials which she uses daily is handicapped.’ The man who knows no chemistry is handicapped too, the manual adds – but strictly in the professional, not domestic, domain. It was the father’s duty to inculcate such knowledge in his son in preparation for a life of work, just as the mother should educate her daughter in the chemistry of cooking and domestic chores. When Gilbert finally produced a set specifically for girls in the late 1950s, fetchingly decorated in pastel pink, it is not exactly a ‘chemist’s set’ at all. 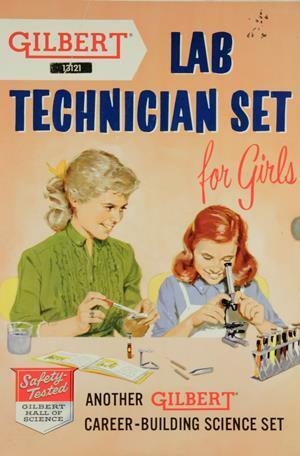 Instead it reminds the girl who squints into a microscope, while her big sister looks on encouragingly, that all she can aspire to is to use her natural domestic skills to become a ‘lab technician’. By the 1970s, things seem to have improved a little. 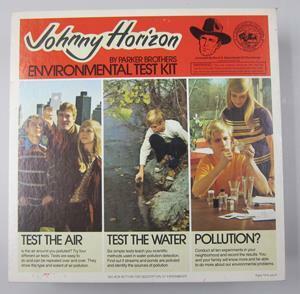 Both girls and boys, as golden-haired and wide-collared as David Soul, feature on the lid of Johnny Horizon’s chemical set, although the girl seems to be reduced to looking on adoringly as her brother (or boyfriend?) does the measuring and pouring. Yet this is no longer marketed as a chemistry set: in the post-Silent Spring era and the age of the newly formed US Environmental Protection Agency, it is now an ‘Environmental Testing Kit’ asking ‘Is the air around you polluted?’ You can examine river waters for contamination too, and the set promises that you and your family ‘will be able to do more about our environmental problems’. How times change. What would those who bought the Johnny Horizon kit have made of Chemcraft’s offering from the late 1940s, which includes ‘safe experiments in atomic energy’, including – probably my favourite element (literally) of the entire CHF collection – uranium ore and a ‘radio active screen’? The latter is incorporated into a ‘spinthariscope’, a device first invented by the chemist and entrepreneur William Crookes in 1903, which uses a zinc sulfide phosphor screen to reveal the scintillations of alpha particles. 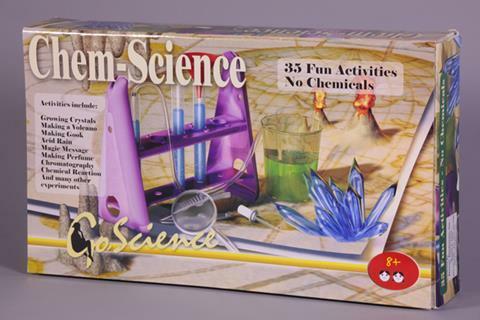 Compare this with the Tree of Knowledge Chem-Science set from around 2000–2005, which – despite offering standard experiments such as the bicarb–vinegar volcano and litmus testing – assures the buyer that the ‘35 fun activities’ contain ‘no chemicals’. 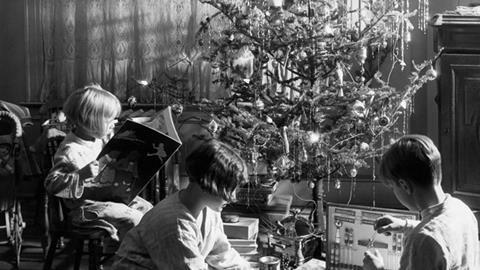 If you’re inclined to bewail this apparent taming of home chemistry for kids, bear in mind that social anxieties about safety are nothing new. A concerned parent wrote to The Times in 1903 warning that ‘the placing in the hands of young boys of such ingredients as chlorate of potash, sulphur, &c., must always be deprecated as a temptingly dangerous proceeding’. This wasn’t simply a matter of changing perceptions of what was hazardous, but also of who was to blame. As medical historian John Burnham of Ohio State university has argued,3 there was an increasing tendency over the course of the twentieth century to switch the responsibility for child safety from parents (particularly mothers) to manufacturers and the ‘engineering’ of the childhood environment. If manufacturers were to be held responsible for accidents, they weren’t going to take any risks. ‘There is no doubt that contents of today’s chemistry sets are far tamer than they were a few generations ago’, says Al-Gailani. But he is not convinced that this is the only or even main reason behind the much lamented decline in popularity of the chemistry set. To understand that, he says, ‘we need a much better understanding of wider shifts in the toy industry, especially the perceived profitability of scientific toys, and the place of chemistry in popular culture’. He thinks that the perception that the chemistry set should play a role in drawing children into science ‘has a lot to do with the iconic status of the chemistry set in writing about scientific careers and nostalgia for a less risk-averse era’ – that it’s a story we tell, but not necessarily the right or complete one. 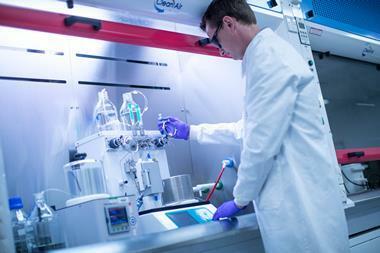 The chemistry set today is rarely marketed with the sobriety of the past. 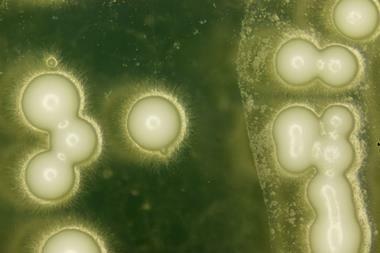 It emphasizes science as fun – smelly, disgusting, tactile and visual. We will surely one day be judged for this, for better or worse. There are certainly dangers in suggesting that chemistry is going to be relentlessly fun and entertaining, selling itself on stinks and bangs, as University College London chemist Andrea Sella argued when accepting the Royal Society Faraday Prize for communicating science this year. But those sensual delights are harder to procure when the range of chemicals permitted in a chemistry set is constrained. 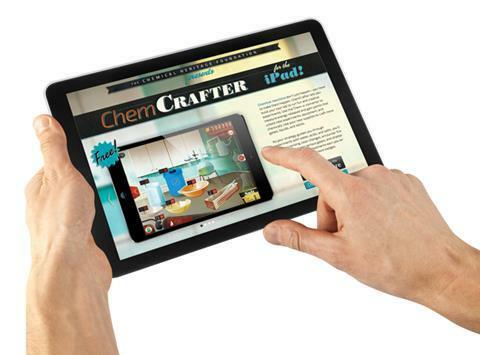 One alternative – which some will see as a poor one, lacking the true tactile and aromatic sensations of chemistry – is the CHF’s Chemcrafter app, tellingly displayed in a 1950s visual style. Yet the questions confronting manufacturers now are in some ways not so different than ever they were. 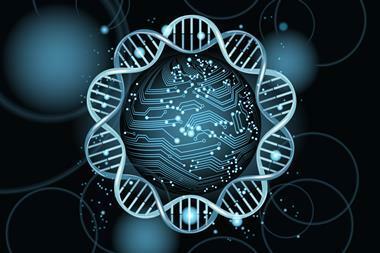 Should chemistry be made to feel exotic or familiar? Are chemistry sets about fun or sober instruction, and how far can the two be combined? Should they be marketed at children (and which children? ), or their parents? Whatever answers we find will say a lot about us to future generations.